People in charge of an organization should not tolerate any inappropriate behavior of their subordinates. Doing so would lead to disrespect of the management, colleagues and juniors, and that will ultimately lead to chaos. 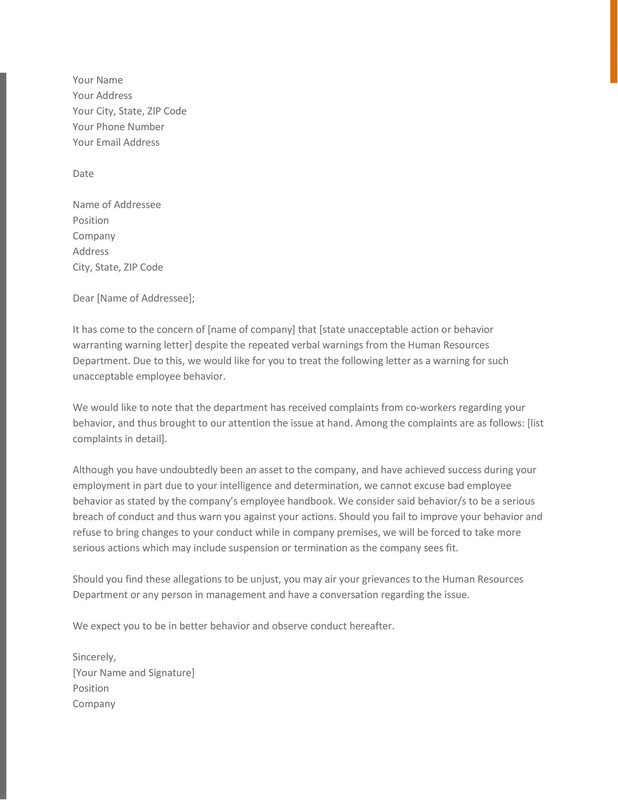 One way to handle this predicament is to write an employee warning letter to the person who committed the unacceptable conduct. 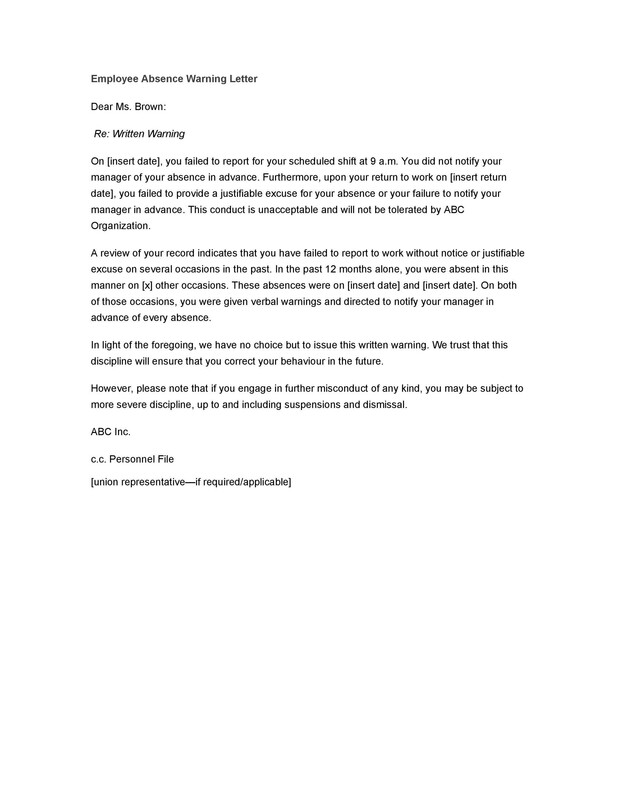 This letter is also referred to as a written Warning, a Letter of Reprimand, a Disciplinary Form or an Employee Warning form. 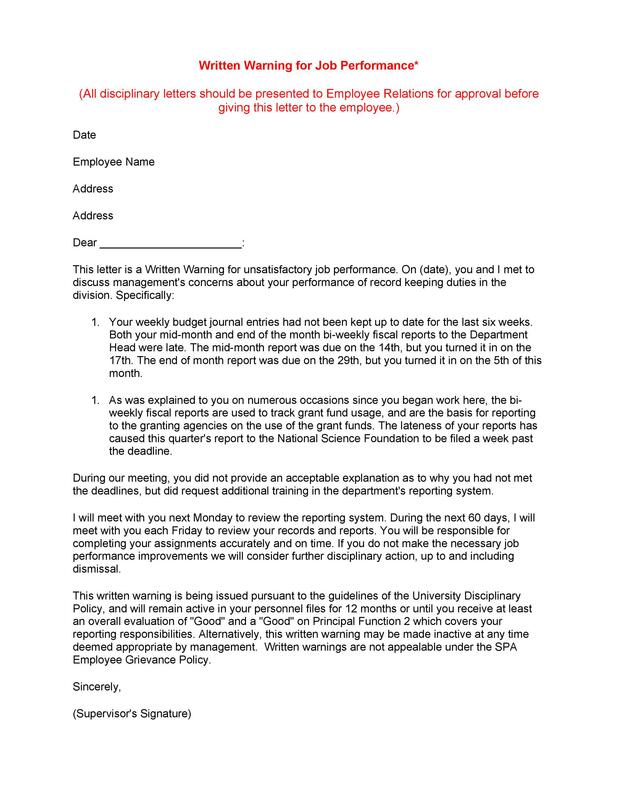 2 When to use an employee warning letter? 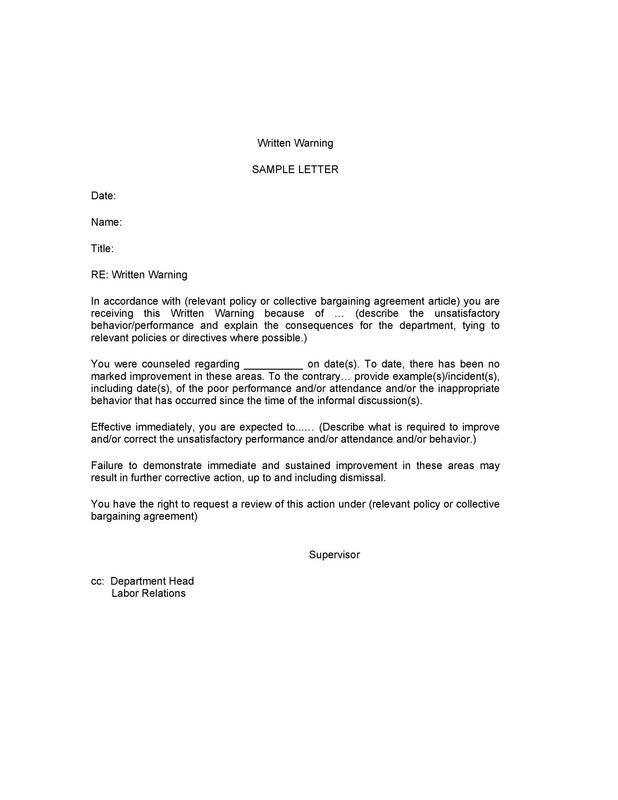 4 What information should you include in the employee warning letter? 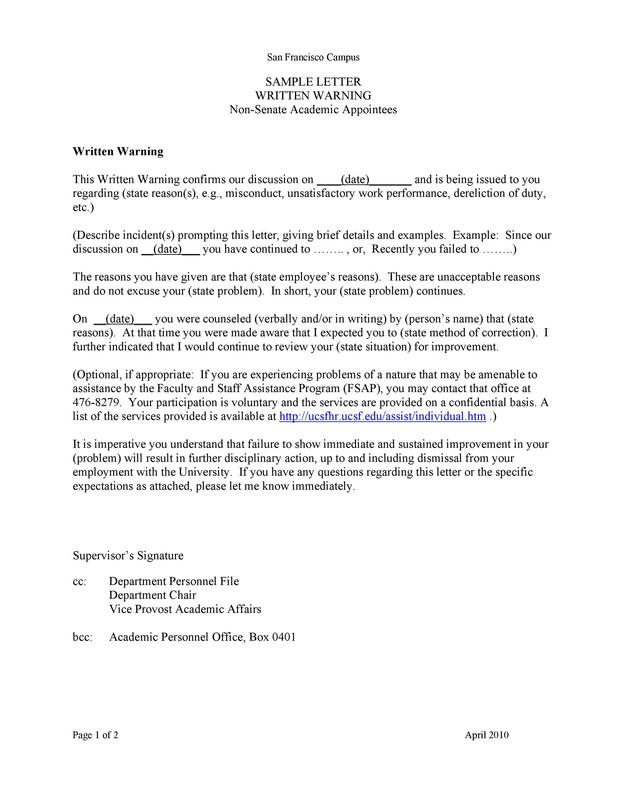 8 How to use an employee warning letter? 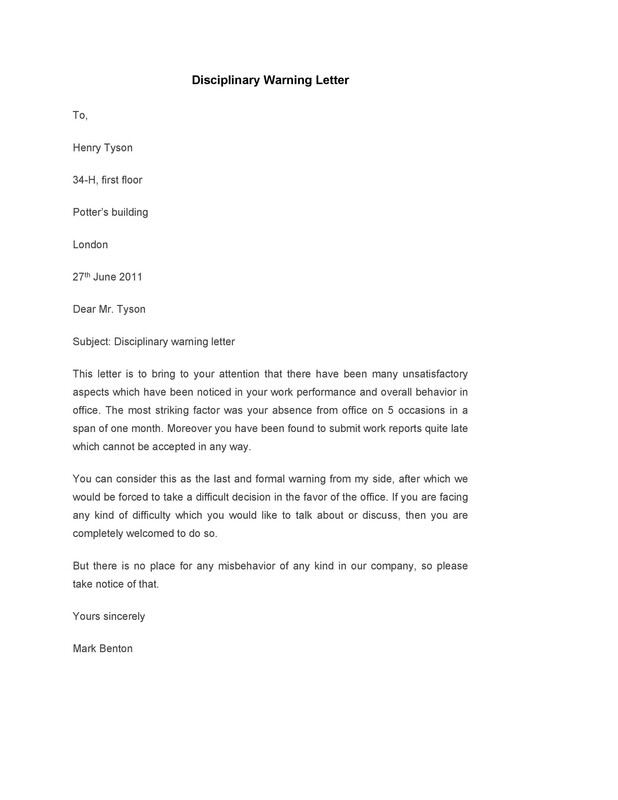 You can use this type of letter to many situations, but its main purpose is to address a wrongdoing. 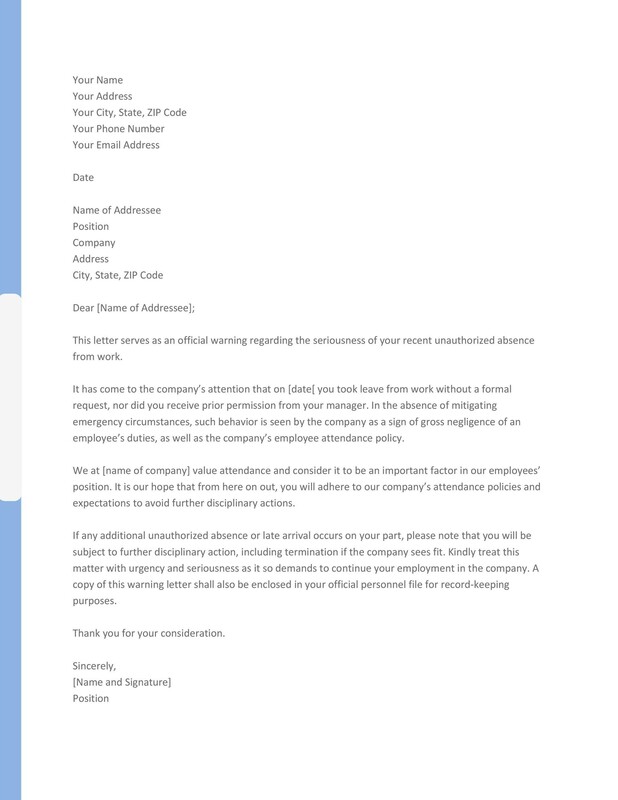 When to use an employee warning letter? Employees are rewarded or reprimanded depending on their performance. It is usually the responsibility of the HR Department to monitor their performances as well as their behavior. 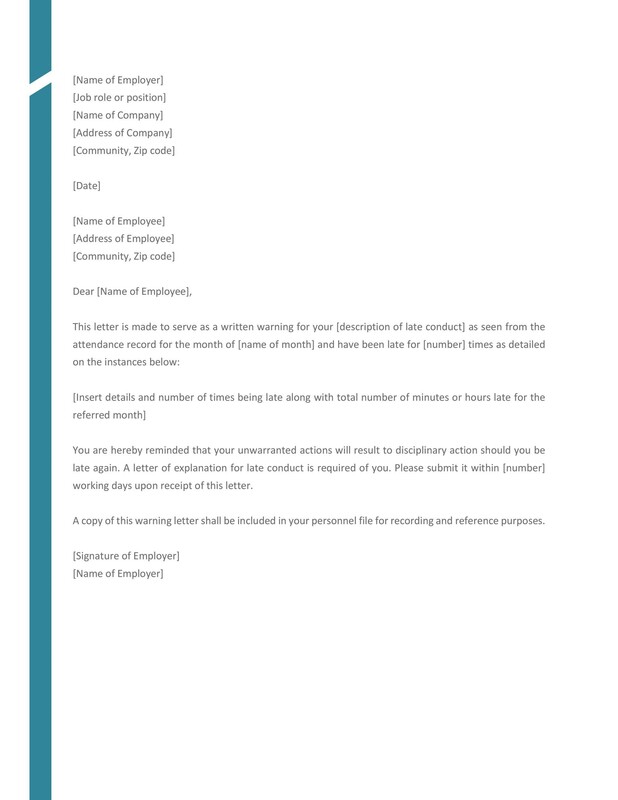 They then issue an employee disciplinary letter if the employee is either underperforming or gets involved in some unacceptable conduct. 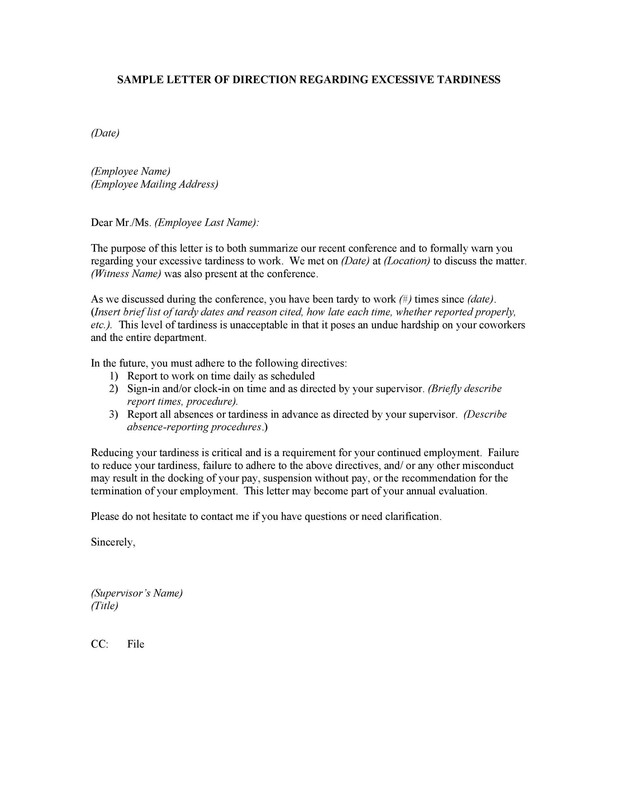 Addressing the letter to the employee can help protect the employer against any future disputes. The employee doesn’t measure to the company’s business standards. You’re aware of the employee’s continuing inappropriate behaviors. 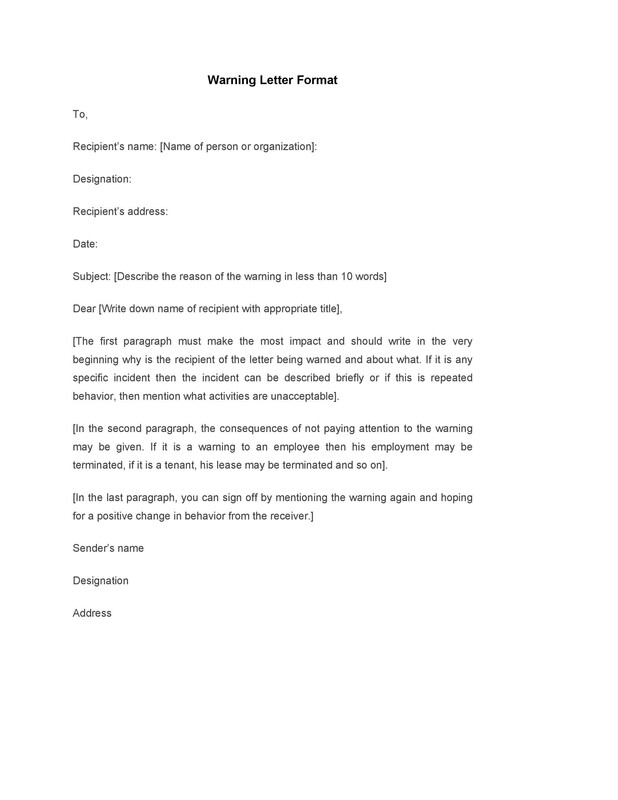 The letter should specify the steps which the employee should take to rectify his situation. 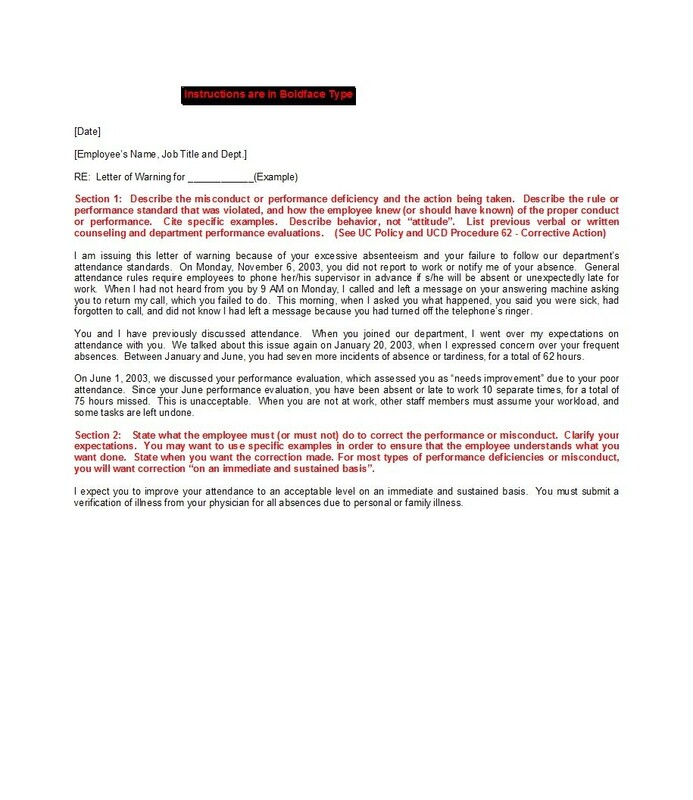 Backup documents like performance reviews and attendance records are the best proof of the employee’s unsatisfactory performance. 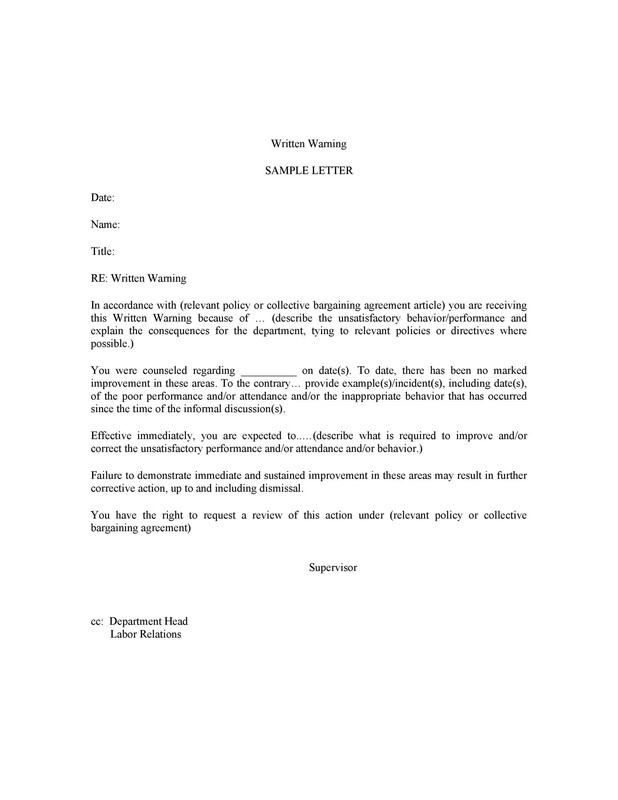 Keep a sample warning letter to employee on file as this can help the employer against any suit, should the employee attempt to sue or cause a labor dispute. 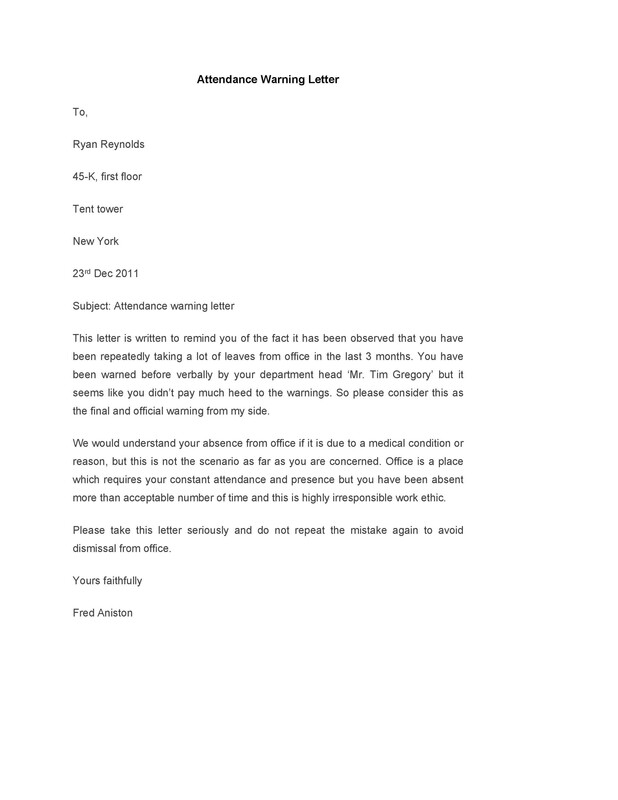 The warning letters are ample enough to dismiss the case. 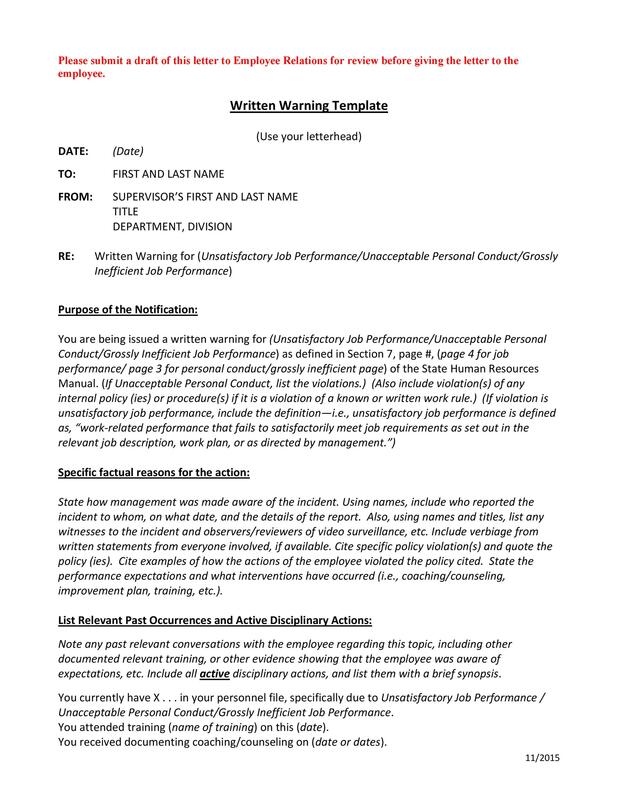 What information should you include in the employee warning letter? The name this letter already speaks for itself. 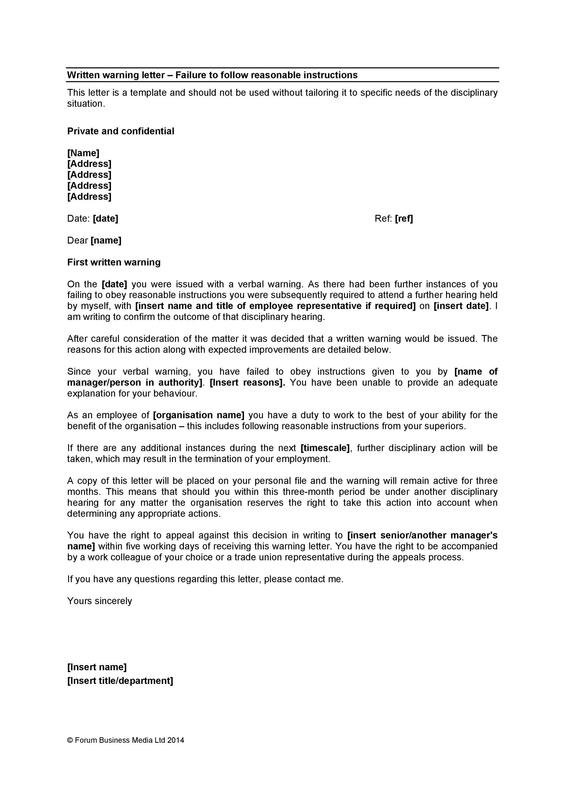 It is a communication from the employer to employee, informing the latter about his breach of the company rules. 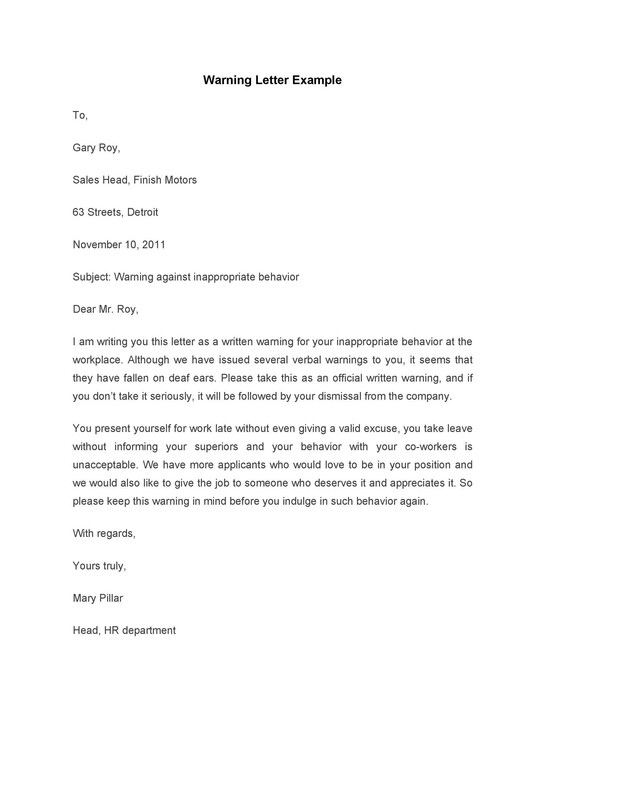 It serves as a warning to the employee about his inappropriate behavior, and the letter may include consequences of his actions. The employee’s personal information like the name, the employee number, and job title. The company’s information like name of the company, the name of the manager, and even the HR officer’s name, when applicable. 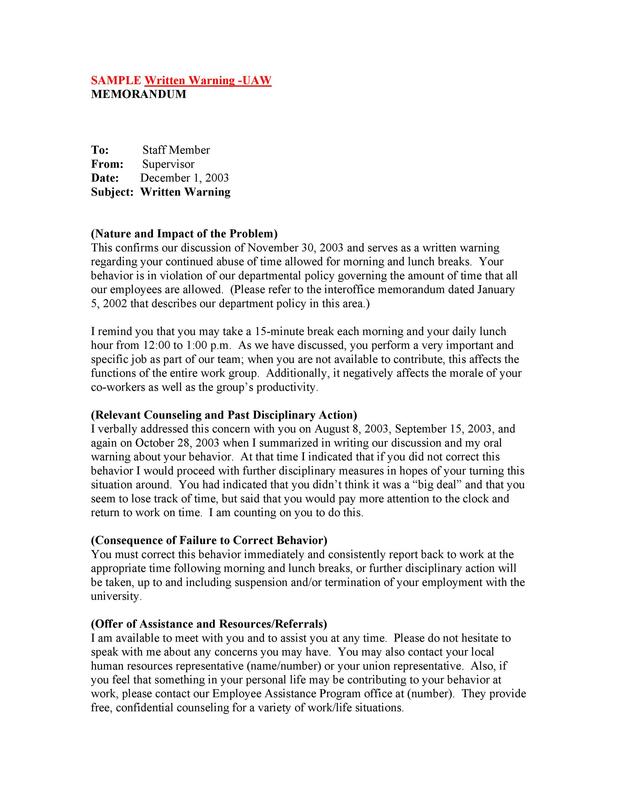 The information regarding the policy or rule that the employee broke because of the behavior. 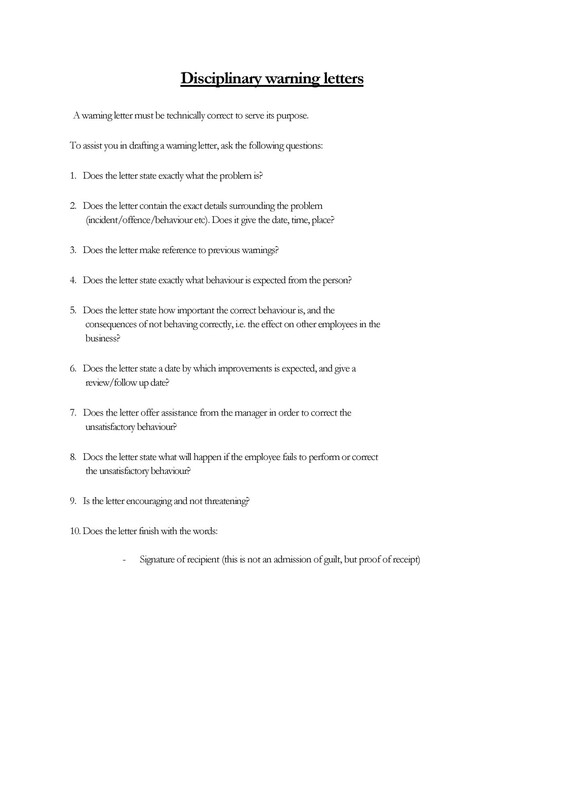 What the employee must do or improve to rectify his situation. 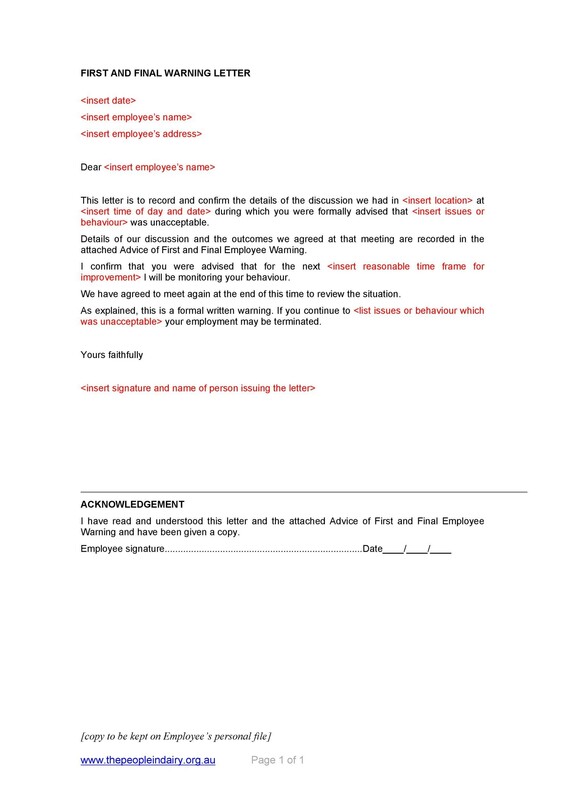 There should also be an area for the employee’s comments, signature details for all of the parties involved, whether a follow-up meeting is still required, and if so, when the follow-up evaluation or assessment will occur. 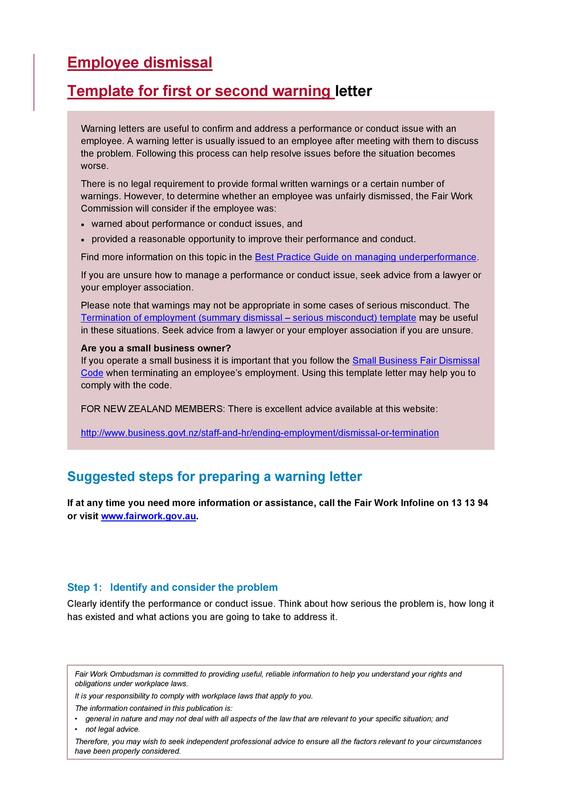 An employee warning letter must generally refer to a particular incident or various incidents which have taken place in just a short time, like a couple of days or weeks. 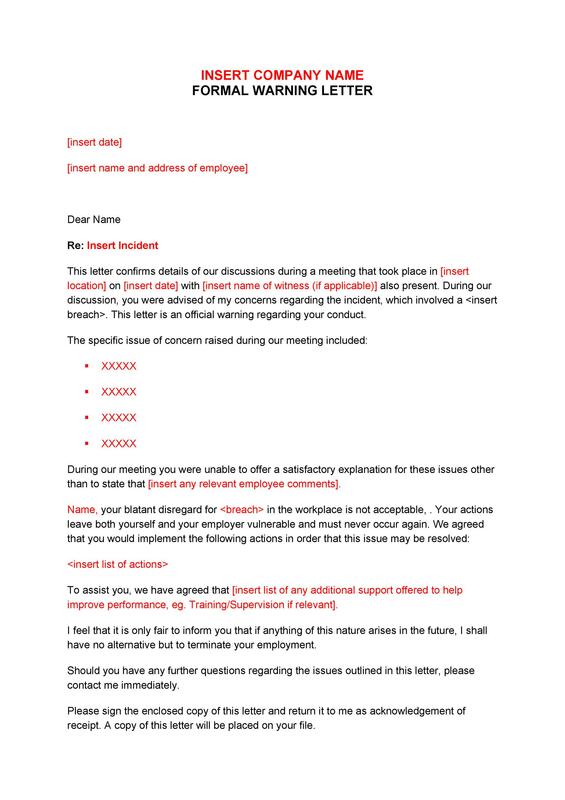 This will ensure that the company keeps detailed records of the incidents and which the employee can easily remember exactly where he committed the mistakes. 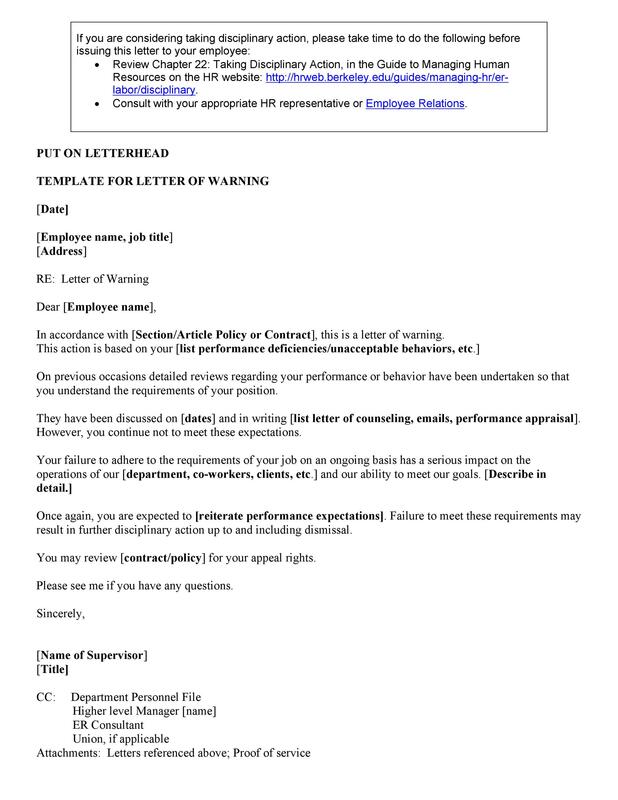 Employers usually issue sample warning letters to employees for unacceptable behaviors or conduct that employees take part in. It’s the last resort warning to the employee that such behaviors aren’t tolerated. It also gives the employee that chance to mend his ways otherwise will suffer the consequences. Go straight to the point. State the conduct or actions of the employee that aren’t unacceptable based on company standards. Also, if the employee keeps on repeating the behavior despite several verbal warnings. 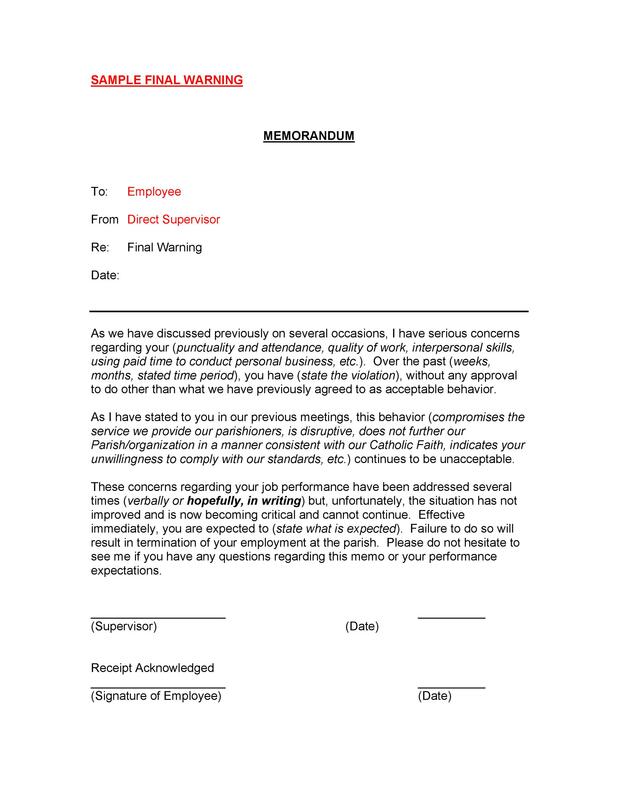 Remind the employee that the letter is a warning for said transgressions. State that if this trend continues, the company will resort to sterner actions which may include suspension or termination. 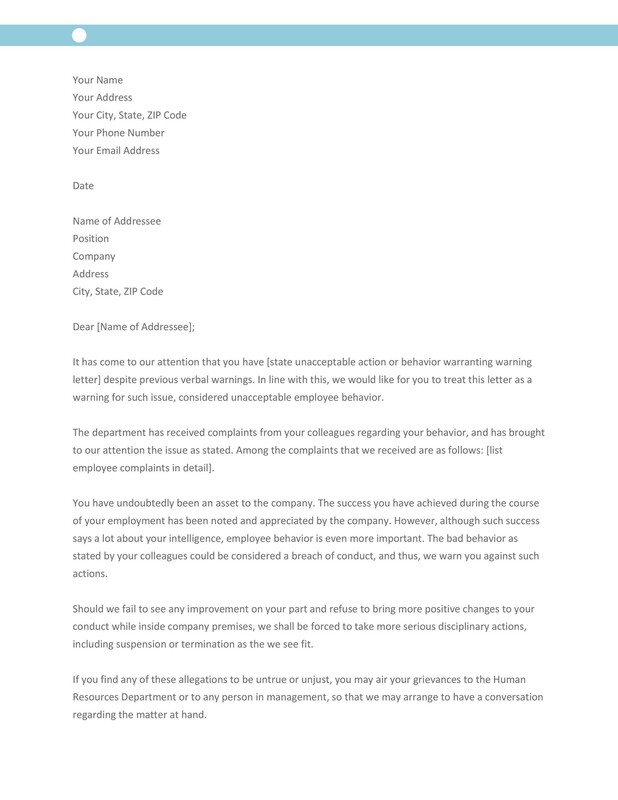 End the letter by requesting the employee to correct his conduct and observe good behavior from hence on. 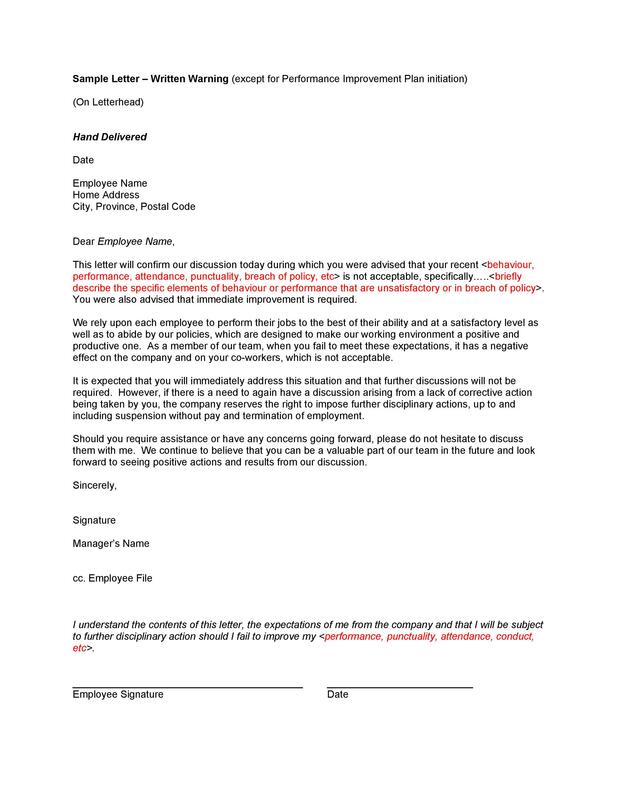 The letter should be very concise and simple so your employee will understand it easily. Also, emphasize the bad behavior from the beginning so that there will be no chance of misinterpretation. Although the letter has a negative connotation, you can still express your intent politely. 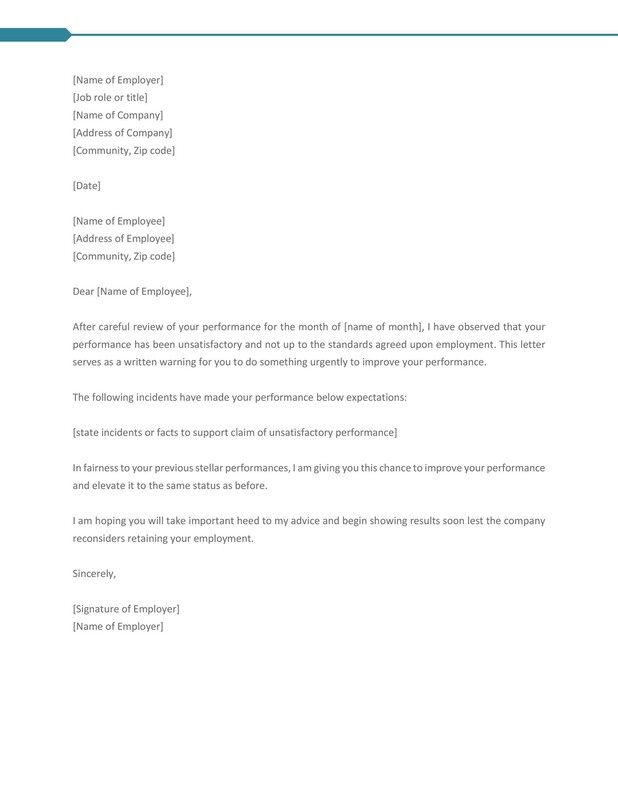 Bear in mind that the letter will also help the employee both personally and professionally. This will ensure the continued smooth functioning of the workforce. 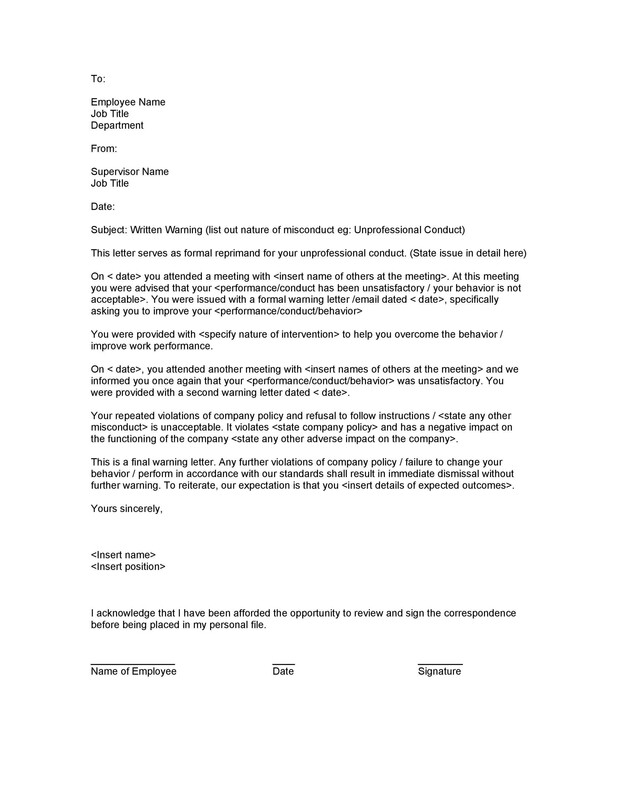 How to use an employee warning letter? Employers have an obligation to their employees and clients to maintain a stable, efficient, and safe work environment. Should any circumstance place this working environment in jeopardy, the employer should have a quick response. 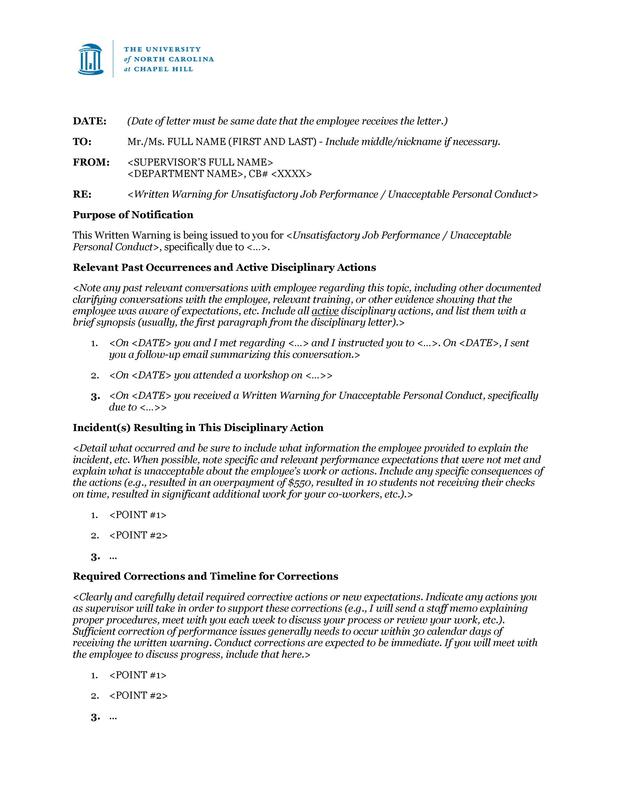 If an employee causes that particular circumstance, then an employee disciplinary letter is in order, especially if earlier verbal warnings given by the employers aren’t followed, or the employee ignores them. 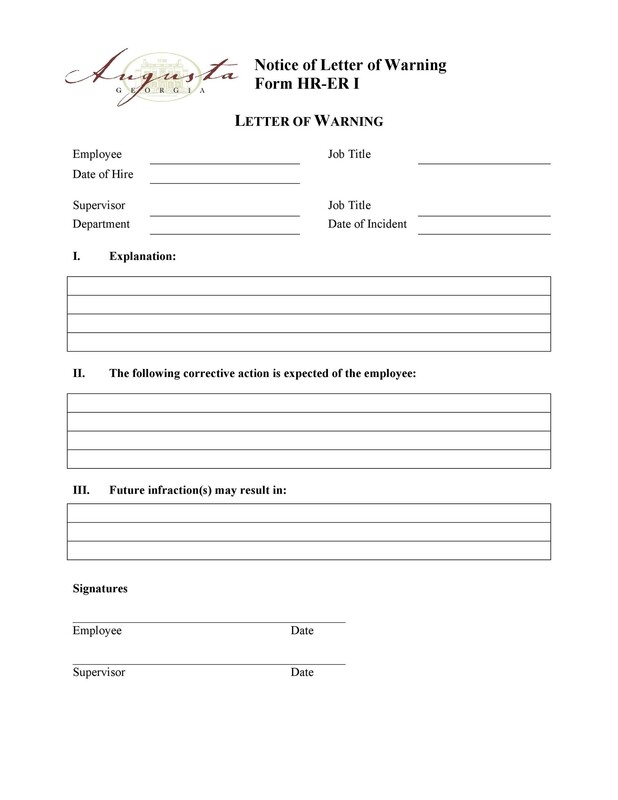 Bad behaviors will prompt the employer to issue a warning notice as a first step to resolve the problem. 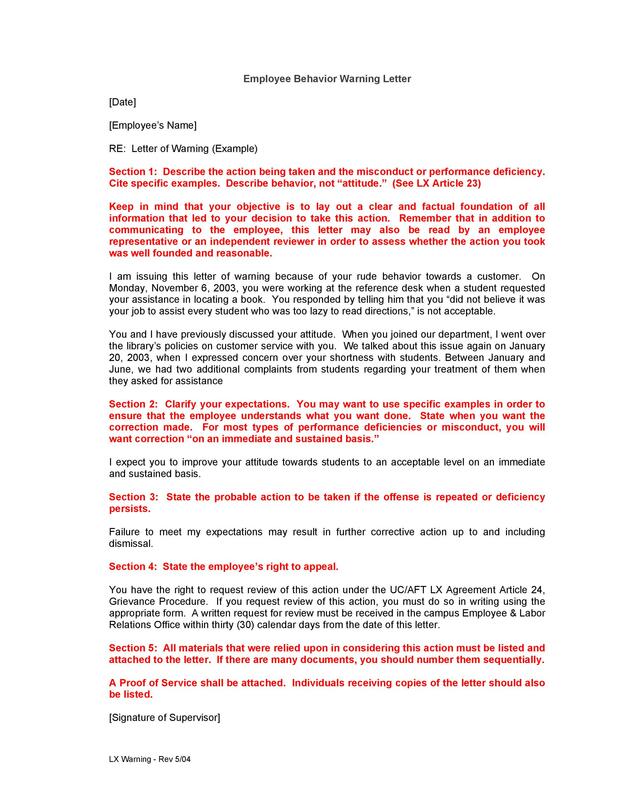 It goes without saying that only a person of authority can issue the warning letter and it’s based on the seriousness of the offense. 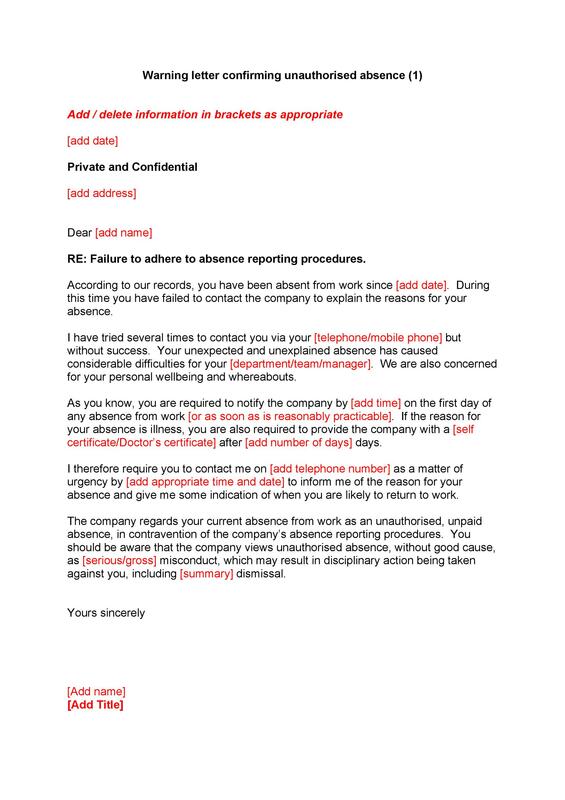 Employers can issue the letter against one person, a group or even a whole department. 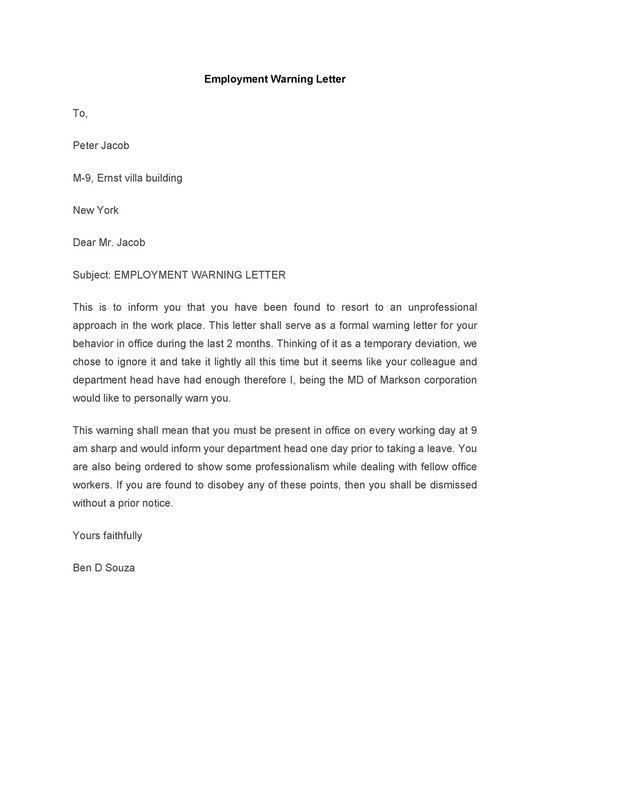 The employee warning letter is an official correspondence between the employer and his employee. It also becomes an official record which you can use for future reference. The National Employment Standards will define the minimum standards for employment. 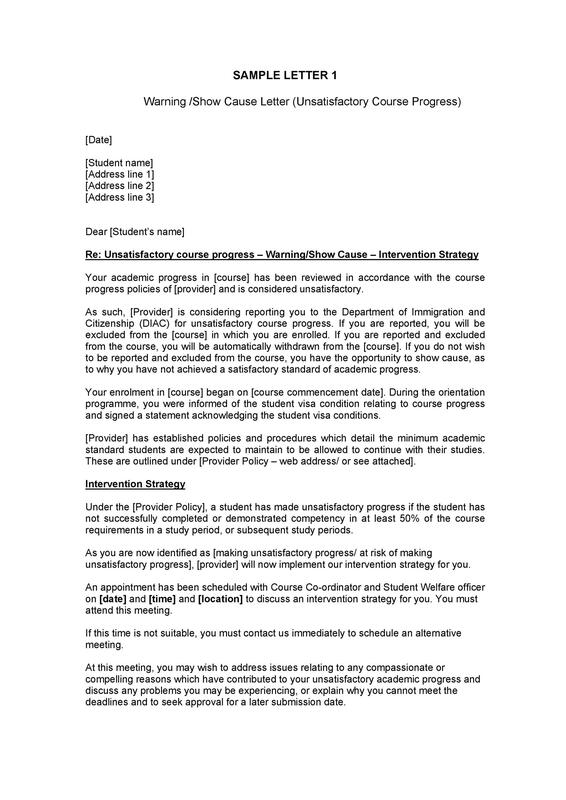 Therefore, you may need to refer to these standards before writing your letter. Should there be an applicable industrial instrument such as an award or a registered agreement, then you may need to attach additional requirements. 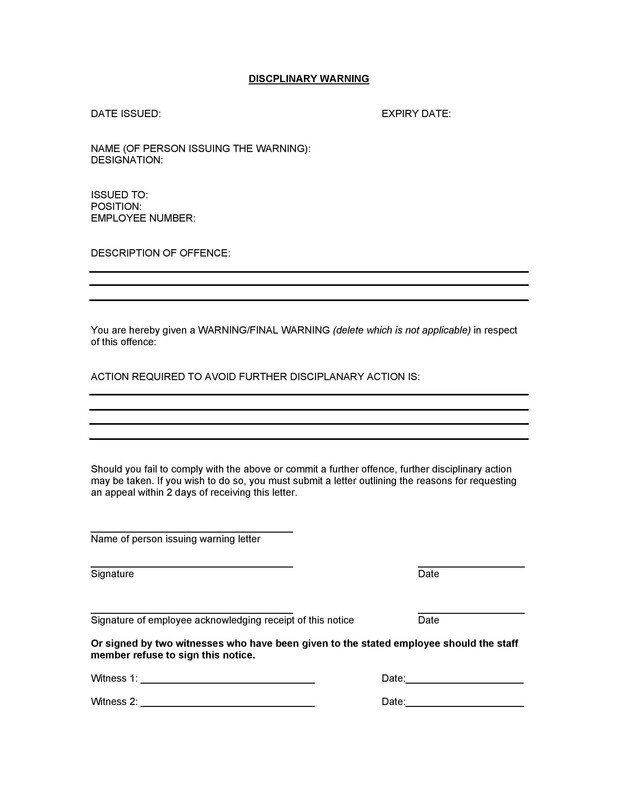 Violation of a contract of employment or a workplace policy might also require additional requirements. 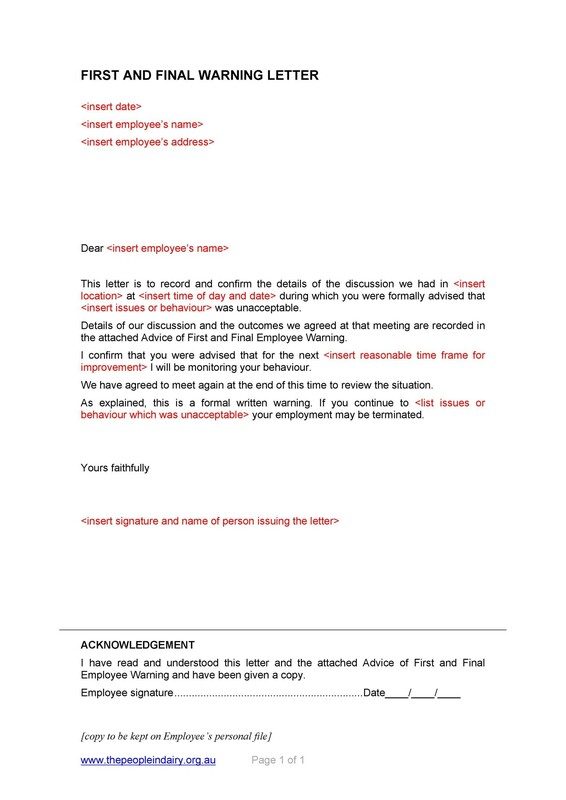 Whatever the case, the employer will need to comply with whatever requirements he needs to comply with when writing the letter. 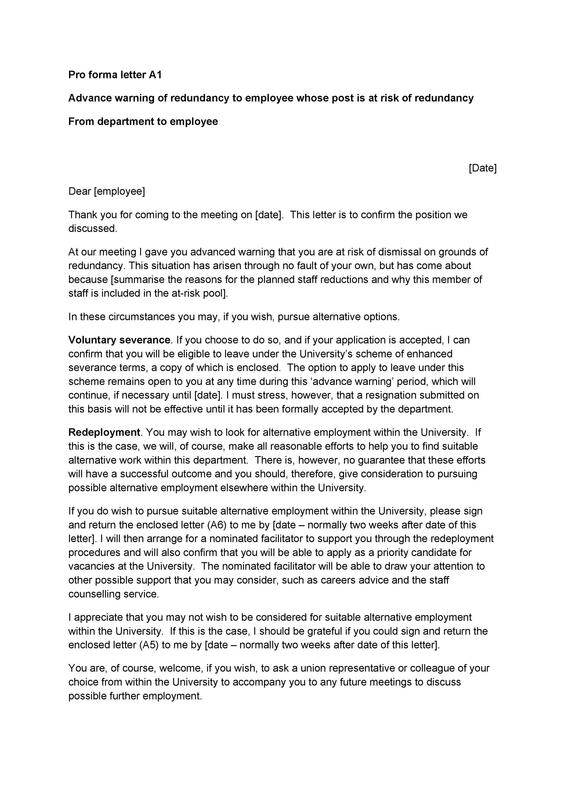 any further comments that the employer or the person preparing the letter on behalf of the employer wants to include. 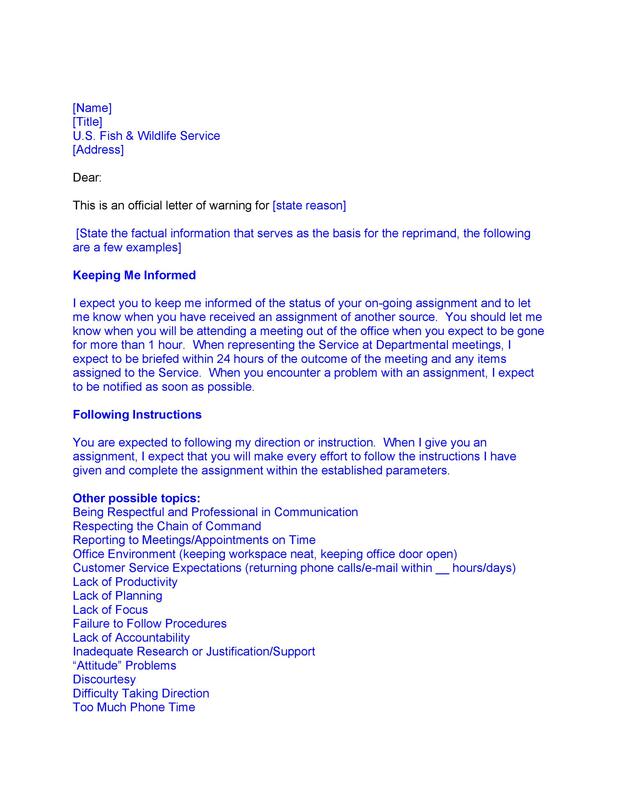 After preparing the letter and collating all the supporting documents, the employer can organize a meeting with the employee. 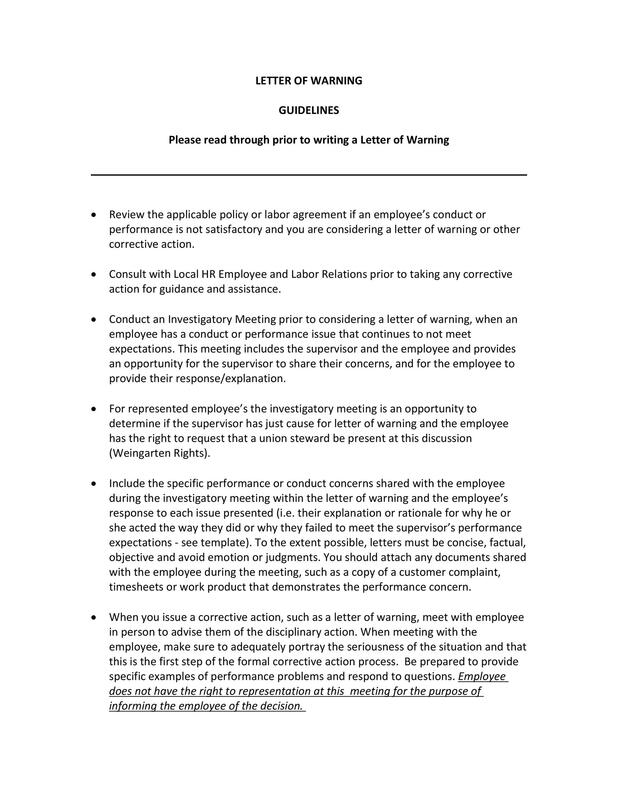 It is during the meeting that the employer should provide the employee with the employee warning letter. The employer should also keep a copy for company’s HR records. 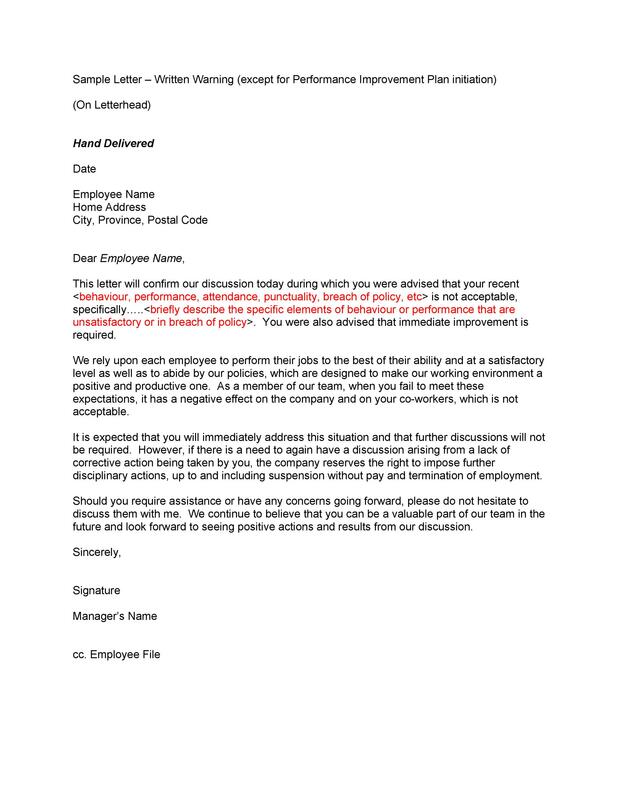 In case the employee is not ready to attend the meeting or join the HR team for a discussion, the employer can have the letter delivered to the employee’s official home address. Professionalism dictates that a meeting is a better alternative but it’s the situation that decides the course of action. 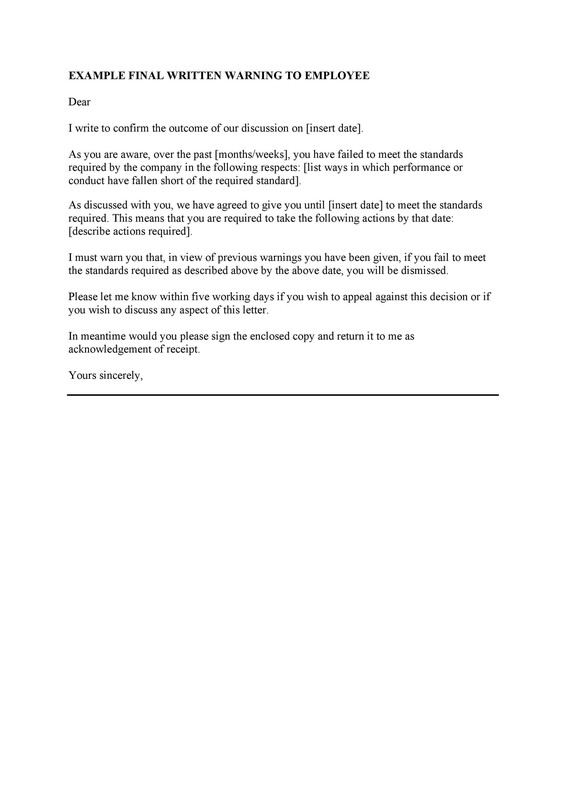 After the employee has accepted the letter, the employer can start monitoring the employee’s performance. If there is a date for a follow-up meeting, the employer will have to keep track of that date and follow-up with the employee as agreed upon. 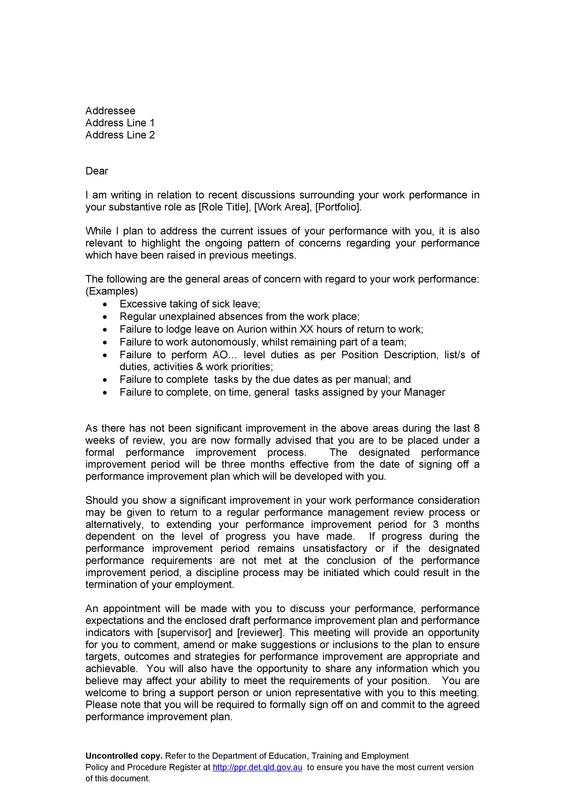 If there be no improvement in the employee’s performance, then the employer will have to write a subsequent warning letter. 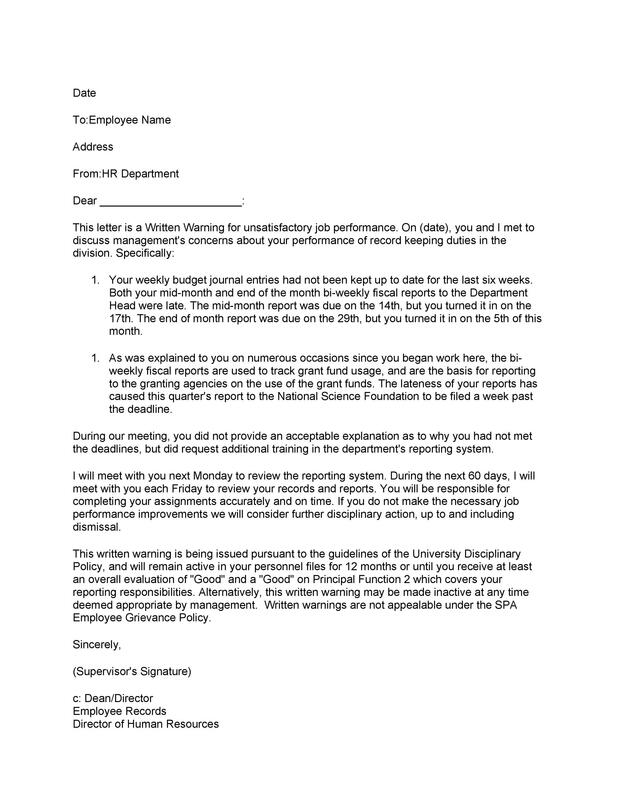 This time, it will be the final warning letter to the erring employee.